Séminaire par Stefan Atze (Helmut Schmidt University Hamburg). Mardi 2 décembre, à 14 heures dans l’amphitheatre Pierre Gilles de Gennes, APC, batiment Condorcet. The challenges for contemporary/todays science and research are neither new nor unique. 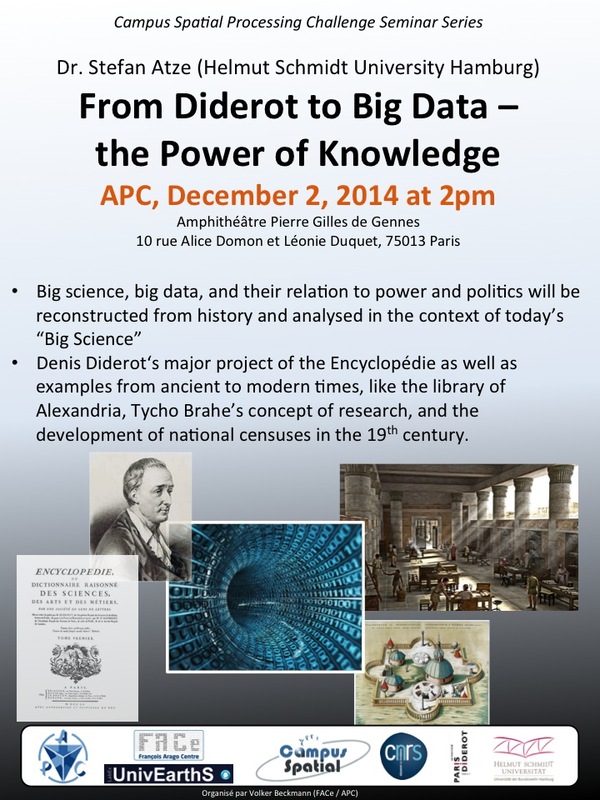 A side glance in the history of science shows that scientist always struggled with issues of big science and big data. Even when large-scale science and an increasing complexity of research data-sets became significant since the 20th century, there have always been the same problems – although in differing dimensions. Like today, big science and big data are no exclusive criteria of natural sciences. The complexity in research processes or the storage of knowledge has also been a matter of different kinds of science in former times. For these preform as well as for today’s “Big Science”, science and research have never found an end in itself. The history of science indicates that science and the source of research data have always been closely linked to power-political interests. Hence, the triangle of big science, big data and power politics will be reconstructed from history of science and analyzed in the context of today’s matters to broad the practical scientific perspective. Points of reference are Denis Diderot‘s major project of the Encyclopédie as well as examples from ancient to modern times, like the library of Alexandria, Tycho Brahe’s concept of research, and the development of national censuses in the 19th century.